A fourth high school student has died from injuries she got in when a school bus nose-dived off an interstate overpass, the police chief said Tuesday. The bus driver, who was found critically injured on the overpass, was among 15 who remained hospitalized, authorities said. Four were listed as critical. Police Chief Rex Reynolds identified the fourth victim of Monday's school bus wreck as Crystal Renee McCrary, 17. Like the other victims, she was a student at Huntsville High School who was on the bus when a car came up in a side lane and the bus veered over the guardrail and crashed about 30 feet below. Investigators Tuesday were focusing on why a school bus cut off by another car on a Huntsville overpass fell over the side of the overpass, landing 30 feet below on its nose and killing three student passengers. Two high school students, Christine Collier and Nichole Ford, died at the scene. A third teen, Tanesha Hill, died later at the hospital, reports CBS News correspondent Mark Strassmann. More than 30 Lee High School students and the bus driver were taken to Huntsville Hospital, which became a hectic trauma center Monday with emergency physicians and staff called in to help as ambulances brought in the severely injured. Five people, including the bus driver, had undergone surgery, a hospital spokeswoman said. Police said the bus, taking students to classes at a downtown tech center, swerved on the overpass, plowed through a concrete barrier and plunged to the street below. Police Chief Rex Reynolds said an orange Toyota Celica driven by another Lee High student apparently came close to or struck the bus, causing it to swerve. He declined to say whether charges would be filed. "Did the Celica hit the bus or did the Celica hit the ramp? We're unsure at this point," Reynolds said. Another student, driving behind both vehicles is sure. "His car started swerving and actually pushed the bus up on the wall and the bus flipped over," the teen said. The dead students were remembered at a memorial service Monday night, reports CBS News' Donna Francavilla (audio). Nichole Ford was a single mother who fought to return to school, even after being shot in the head. "She has a baby, and she had to get out of school for a little while, but now she's back in school, and she was going to graduate in May," said friend Cornelius Ford. From her window seat in a school bus packed with laughing classmates, LaWanda Jefferson spotted a passing orange car seconds before she felt herself catapulted sideways. "The bus went to the side, and I guess it went over," she said. "When it was falling ... I was just glad when it hit the ground." 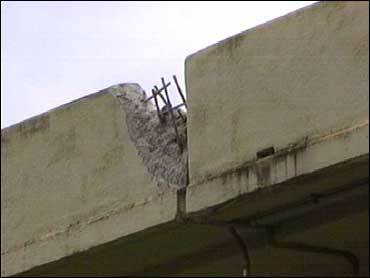 It struck the ground nose-first, about 30 feet below the I-565 overpass. Two teenage girls died in the wreckage; a third died later at a hospital. "They were falling on each other. People were screaming, yelling, crying," said Jefferson, 16, who suffered fractures to her left arm and cuts and bruises to her face. Students on the bus, which was not equipped with seat belts, were screaming when rescue workers arrived. "They were thrown all over the bus," said Huntsville Fire Chief Dusty Underwood. Some had to be extracted from the crumpled front of the bus, he said. Some parents were called to the scene by wailing children on cell phones. Many were angered that police held them back or had no information. At the hospital, some collapsed in tears amid more confusion. Hospital officials said the horror of the wreck was compounded by the inability of hospital staff to identify some of the more severely injured students who were unable to talk and had no identification on them. The police chief said the driver and a passenger in the Celica went to a hospital following the crash, but he was not aware if they were treated for injuries. He said the driver was interviewed by police. The bus driver was in critical condition, said Brooke Thorington, a spokeswoman for the state Department of Education. "This is a heartbreaking tragedy," said Gov. Bob Riley in a statement in Montgomery. The National Transportation Safety Board, which was to investigate the wreck, has said that school buses are designed to protect occupants without the use of seat belts. A new design uses strong, well-padded, high-backed seats, closely spaced together, the NTSB has said. However, NTSB board member Debbie Hersman said at a news conference Monday night that the board last week added school bus safety to its list of most wanted transportation safety improvements. She said the board is recommending that new standards be devised to improve safety when buses are involved in rollover crashes.